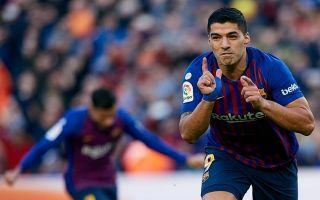 Barcelona superstar Luis Suarez has added another tattoo to his collection ahead of Barcelona’s all important derby against Espanyol this evening. The Uruguayan has decided to get a tattoo of his trademark finger-kissing celebration on his neck, the forward always does the same routine when he scores to honour his family. Suarez kisses his wrist – where there is a tattoo of his eldest child, his daughter Delfina, Suarez then kisses his ring finger to honour his wife before finishing the routine by kissing three of his fingers to honour all of his children. Luis Suárez has done a neck tattoo of his trademark celebration, which honours his children and wife. Suarez’s latest tattoo was first posted on the Instagram account of OTRO – a new digital content platform that gives fans an exclusive look into players lives.